Vintage 2000 and bottled in 2011. It has gotten an Amoroso Sherry cask finish. 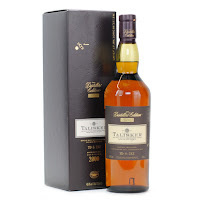 You get the classic Talisker character in the smell mixed with some dried fruity notes in the background. The fruity notes actually works very well with the salty maritime character. Very smooth for a Talisker in the taste. Some oak and some good bitterness (does that make sense??). The mellow peat and the fruity notes blends perfectly together. The fruity sweetness really does the trick in the finish as well. I really love how they found a way to mix the salty maritime character with the fruity style from the Sherry casks. A very well balanced Talisker compared to the more rough character they normally have. I will rate this 89/100 (22/22/23/22).